Our logo - Let us know what you think! We wanted something bold and different, something that conjures up country in folks' minds, something easily recognizable at 50 mph. The idea is to be remembered, laughed with, not laughed at. 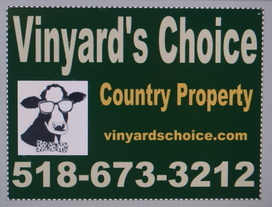 Here at Vinyard's Choice, we take our business very seriously. We can laugh and joke and have a good time with you when we go out, but when it comes to business, it's serious. Real estate decisions are momentous ones for you and we want to make sure you make the right choices. We want you to know we will be there for you, to guide you through the process and to keep things moving once the attorneys start their part. Our goal is to sell every property - once.